12 “What do you think? If a man has one hundred sheep, and one of them goes astray, doesn’t he leave the ninety-nine, go to the mountains, and seek that which has gone astray? 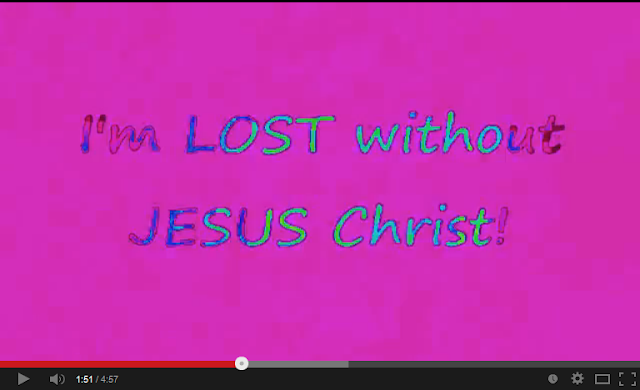 Music video dedicated to anyone who's LOST without JESUS Christ. YOU ARE LOVED by God the Father, who gave Himself in the capacity of JESUS to die for (Y)OUR sins! ALL BECAUSE OF LOVE! The song after (lowered in pitch in order to fool YouTube's copyright-scanner-software) 'Amazing Grace' is from the Christian Punk/New Wave rock band UNDERCOVER. I like you near me, will you stay? I believe that you, JESUS Christ died upon the cross for me, and I believe that you shed your blood for the forgiveness of my sin, according to the scriptures. I believe you were buried and I believe that on the third day you rose from the dead, according to the scriptures. and went to Heaven to prepare a place for me. I believe you are my Saviour, my Lord, my friend, and I thank you Father that I'm filled with your Holy Spirit and that I'm sealed forever. Thank you for dwelling in my heart through the Holy Spirit and that you have set me free from all of my sins. And because you are my Saviour, I shall not perish but have everlasting life, AMEN! 15 1 The Gospel that Paul preached. 3 The death and resurrection of Christ. Certainly a person can be saved WHEN they pray, but no one is saved BY their prayer. It also gives the history of the "Sinner's Prayer" Mentality, and then shows the true Gospel of Salvation in 1 Corinthians 15:1-4, and salvation by FAITH from the HEART, and not by SPEAKING only from the LIPS. Remember this: the FOUR Gospels, Matthew, Mark, Luke and John are in the first place meant for the JEWS, God's CHOSEN PEOPLE (the ELECT) and that the NEW COVENANT started with the DEATH and RESURRECTION of the Lord JESUS, and that the GOSPEL of GRACE is the MYSTERY that was revealed to us by the Apostle Paul, on behalf of the Lord JESUS. IS JESUS "GOD?" - In 5 Minutes - the matter is SETTLED - Indisputable! We ALL deserve to be cast into the lake of fire and NO ONE is BETTER or WORSE than somebody else and ONLY JESUS is RIGHTEOUS and GOOD and FULL of LOVE and COMFORT, because He is God, manifested in the flesh, who gave His life for YOU and me on the cross. Not all links are still working. Are you saved by JESUS through the gospel of Paul on behalf of JESUS?